Many congratulations on a sensational season so far for reigning champion amateur Simon Walker, who put the icing on the cake with his win at Epsom in the newly programmed Gentleman’s Epsom Derby on Monday, sponsored by Tompkins and May. 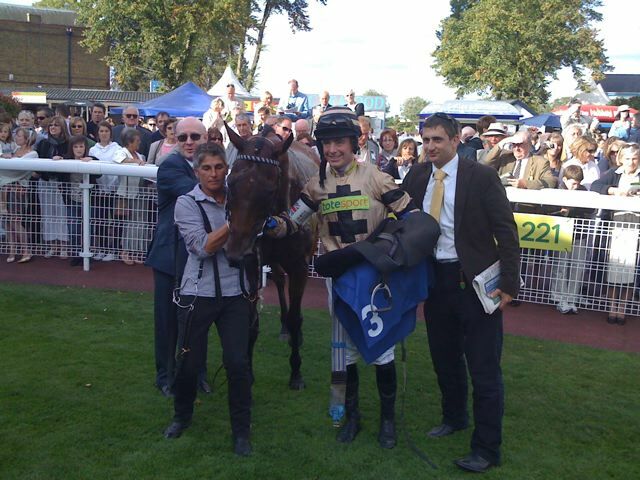 This was a first success for Simon at Epsom having been placed many times in this Derby in the past, the race having been held at Sandown for the past two years with Epsom’s rebuilding programme being undertaken. This gentleman riders’ amateur Derby, which is now open to all amateur gentleman jockeys who have completed 5 rides on the Flat, has undergone a change in the Programme Book for this season (having been a Fegentri race in the past and originally sponsored by Moet and Chandon) in order to allow AJA members every chance of the exhilarating experience of riding around this unique course. 9 runners went to post and a disaster was averted when Stephen Harrison sat tight with his horse, Hughie Morrison’s SLEEPY HOLLOW, stumbling badly on exiting the stalls. No one was keen to make it and a very steady pace was set with WICKSY CREEK leading the field around Tattenham Corner but as they came down the hill the pace quickened and Simon Walker and Philip Hobbs’ HIBIKI strode away to hold his rivals and win by 3/4 of a length from SLEEPY HOLLOW with Pat Phelan’s Ladies Epsom Derby winner EPSOM SALTS and Marcus Price held in third by another 3/4 of a length. 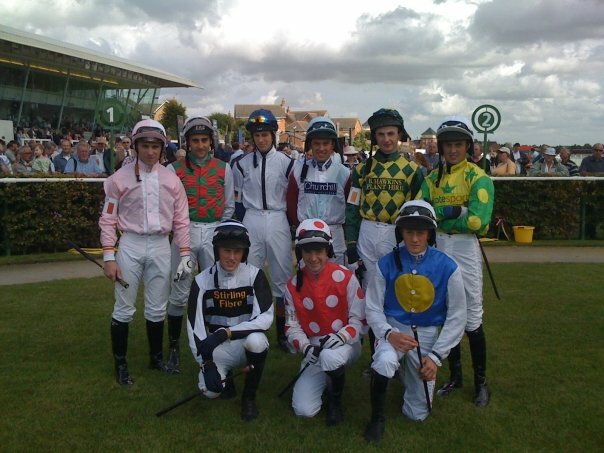 Clairefontaine on Saturday was a bitter sweet experience for leading amateur lady jockey Faye Bramley. 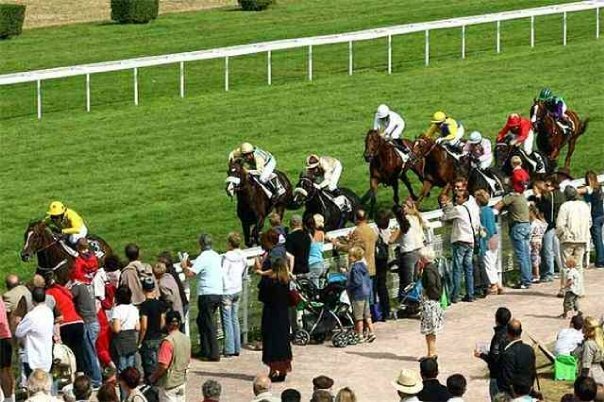 As the only English jockey taking part, Faye enjoyed a facile win in the Prix du 21eme Arrondissement Prix des Pervenches for trainer Eoghan O’Neill aboard BARRICADO. Unfortunately Faye was dislodged from the saddle after pasting the post and the fall broke her ankle. A wheelchair had to ferry Faye back to the weighing room for her to weigh in before being whisked off to hospital and we all wish her a speedy recovery and a swift return to the saddle. A Fegentri August Bank Holiday weekend was hosted in Great Britain with races not only at Royal Windsor but also at Goodwood.Saturday evening kicked off with the first race of Royal Windsor’s card being THE AJA INSURE MEMBERS FEGENTRI WORLD CHAMPIONSHIP STAKES for gentleman amateur riders. 7 nations were represented with jockeys from France, Germany, Ireland, Belgium, Italy, USA and The Netherlands; sadly Dutch rider Peter Janssen was drawn on a non-runner and 9 went to post. An early fast pace was set by Florent Guy, prolific winning French jockey (220 Flat wins) on Keith Goldsworthy’s front running BOLTON HALL. As the race progressed and the field turned for home, the runners spread across the track. Out of the pack emerged the oldest horse in the race – Jim Boyle’s 11 year old SKY QUEST ridden by Ian Chanin who went on to win in fine style from Marian Weissmeier for Germany in second on Karen George’s KING’S FABLE, Fabio Locatelli for Italy on Julia Feilden’s SAND REPEAL and Florent Guy finished fourth. Next day the scene was set at Goodwood for the Fegentri World Cup of Nations by kind invitation of the Duke and Duchess of Richmond. Back row: Pauline Boisgontier (France), Andrew Doyle (Ireland), Vanessa Rodenbusch (Germany), Marian Weissmeier (Germany), Arthur Hoyeau (France), Front row: Georgina Andrews (GB), Phil Collington GB), Mario Baratti (Italy), Fabio Locatelli (Italy). 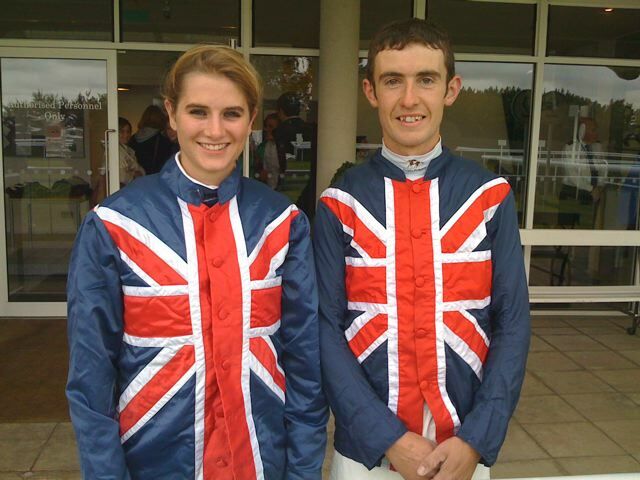 Great Britain was represented by Georgina Andrews and Phil Collington and teams were also in place for France, Germany, Italy and one rider for Team Europe, that being Andrew Doyle from Ireland. 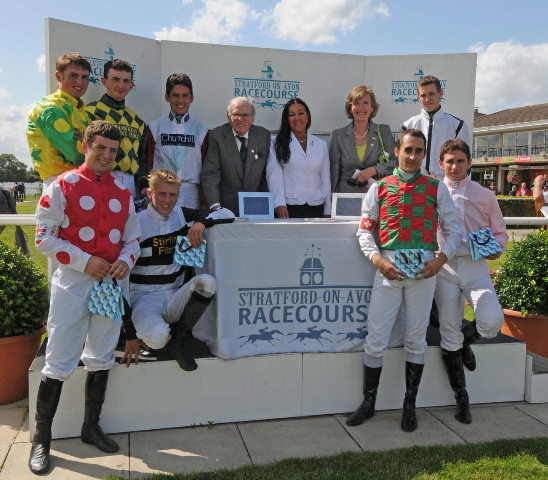 It was a great shame that the USA team were not represented; their lady rider was unable to travel over do to a delay in her passport being issued and it was most unfortunate that on the morning of the race we had a non-runner which was to have been the ride of US jockey Jacob Smith. With the field reduced to 9 runners, the field was led by WHOSIT (Vanessa Rodenbusch) until the final 3 furlongs when a battle began between POTENTIALE (Mario Baratti) and THEOCRITUS (Phil Collington) trying to get on terms, but victory could not be denied for John Hills and his Italian rider to hold on well and score by 3 lengths. This was a great result for John who has always been such a loyal supporter of Fegentri races in this country and won the Fegentri Amateur Derby at Epsom himself as an amateur jockey in the past. Many congratulations to all winning connections on a great result! 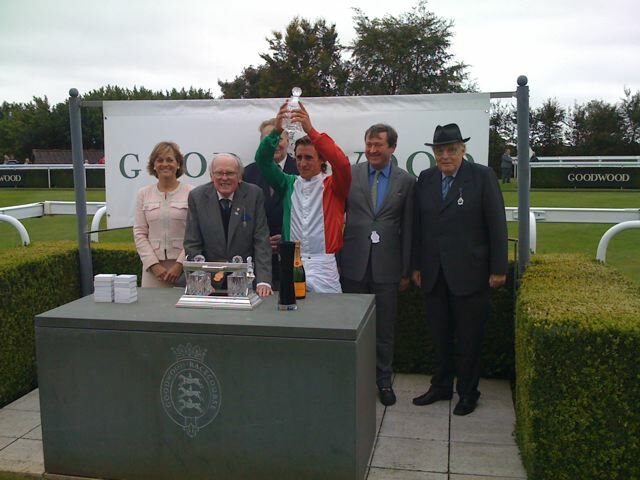 Winning jockey Mario Baratti holds aloft his prize decanter accompanied by Nathalie Belinguier (President Fegentri), Gay Kindersley (President AJA), John Hills (winning trainer) and The Duke of Richmond. The annual AJA Northern Dance will be held at SCOTCH CORNER HOTEL on Saturday 21st November. Tickets are available as in previous years from Serena Brotherton and Carol Bartley who have kindly volunteered once again to run this event and to avoid disappointment it is advised that you book early! Dancing will be to THE ZOOMS and tickets are fantastic value at £40 each with the option of an overnight stop at special rates. For further information and to book please contact Carol Bartley on 07734 303862 or Serena Brotherton on 07740 257110. 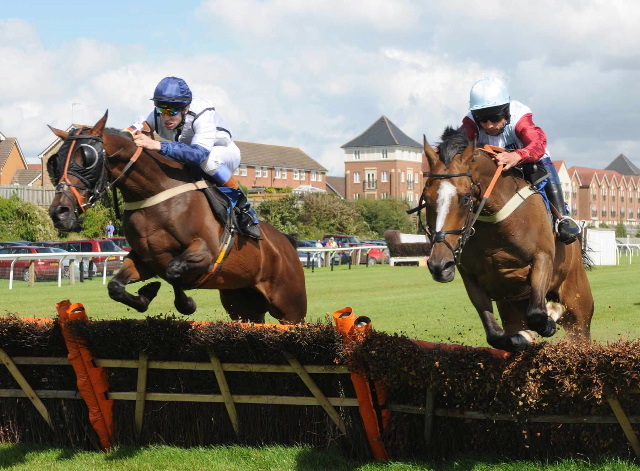 Fegentri returned to Stratford-upon-Avon on 20th August for the gentleman amateur riders’ invitation hurdle with 9 runners going to post. 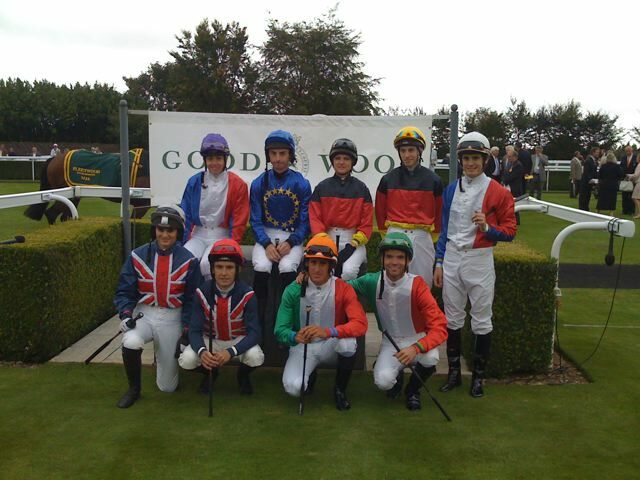 Jockeys’ photocall (L to R back row): Florent Guy (France), Urs Wyss (Switzerland), Marian Weissmeier (Germany), Oliver Greenall, Andrew Doyle (Ireland), Tom David, (front row): Harry Challoner, Ian Chanin (Great Britain) and Sam Twiston-Davies. Unfortunately France’s leading amateur jockey Florent Guy, with 220 wins on the Flat, was unseated at the second flight but the race soon developed into an interesting challenge with Marian Weissmeier for Germany leading the field on Tim Vaughan’s DABARATSA. Oliver Greenall always had the leader in his sights and kicked on approaching the last flight to lead as the post approached and win comfortably by 2 lengths for Ian Williams on KICKAHEAD. Oliver, current NH amateur champion and last year’s national point-to-point record breaking champion, was emulating his brother and previous champion amateur rider Thomas, who won this race in 2007. Marian Weissmeier was second, which took him into the lead of the Gentlemen’s Fegentri tables, with Urs Wyss for Switzerland in third and Andrew Doyle for Ireland fourth. Marian was last year’s youngest German champion amateur jockey ever at the age of only 16. Fresh from her victorious Newbury Ladies Derby only five days before, Serena Brotherton came to Epsom full of anticipation for the thrill of rounding Tottenham Corner in what was to be the first amateur lady jockeys’ race ever held on this historic track. With 8 runners going to post, Emily Jones and ESEEJ led the field together with Kelly Burke and DRAMATIC SOLO but it was to be the two horses held up throughout who were to provide the final dramatic stages of the race. Emma Littmoden and LORD THEO always had the leaders in her sights but Serena Brotherton and EPSOM SALTS were never far away and stayed on by a neck to take this first Epsom Ladies Derby. This was a great result for local trainer Pat Phelan and an extraordinary conclusion for Serena Brotherton, having competed in and won 2 Derbys in 5 days. Many congratulations to winning connections! A field of 13 went to post for the Ladies Derby at Newbury on 15th August sponsored for the first time by UK Hygiene.Gerard Butler’s JUST LIKE SILK, ridden from behind by Serena Brotherton and tracking the leaders to go into the lead 2 furlongs from home and come clear to win comfortably by 4 lengths, ran on to give Serena her second successive Newbury Derby win, with Katie Walsh and SAFEBREAKER hanging on to second place ahead of Emily Jones on the gallant 10 year old WIGGY SMITH a neck behind in third and Hayley Moore on her father’s FUNDAY a further neck behind in fourth. Many congratulations to the winners! Fresh from the first Flat victory of her prolific point-to-pointing career when scoring in a ladies Fegentri race in Sweden on 24th July, Claire Allen was victorious again on the Flat in Deauville in the ladies Fegentri there on 9th August. 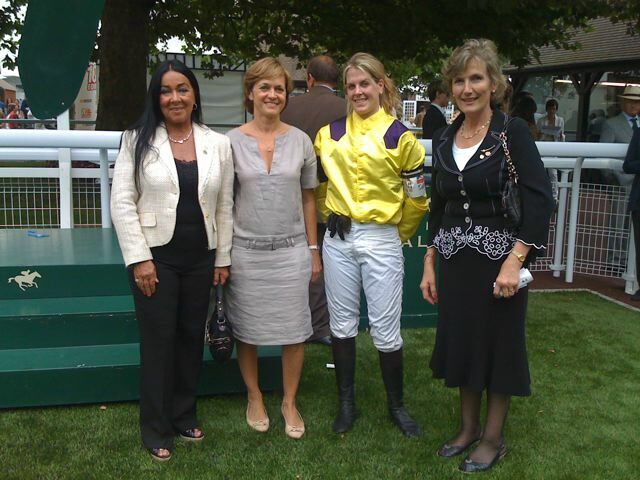 Claire is no stranger to scoring in France, having won 3 times over jumps there – twice when working for top French trainer Guillaume Macaire and once when becoming the first lady jockey ever to win the cross-country race in Nuilly-sur-Vicoin. This victory was especially significant as the top scoring points pushed Claire into the lead in the race for the Fegentri Ladies World Championship! The strains of the National Anthem were played whilst Claire received her prizes from Nathalie Belinguier, President of Fegentri. 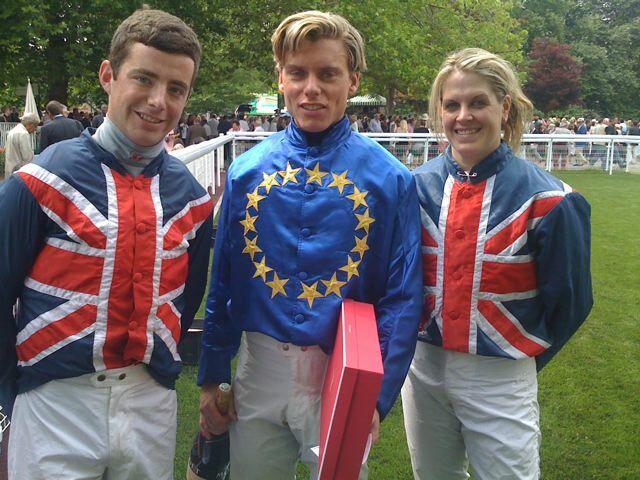 The Fegentri World Cup of Nations featured later in the day and another British amateur jockey’s success was enjoyed when David Dunsdon rode as part of Team Europe and enjoyed a comfortable victory. The inaugural running of Rina Tairo Jewellery Brighton Belle Lady Riders’ Handicap was a welcome return to Brighton Racecourse for lady amateur jockeys after an absence of a few years.The race got off to a dramatic start when Lucy Horner, more familiar to us over jumps as reigning National Hunt amateur lady champion jockey, was unshipped from GRANNY MCPHEE. Early on several rides pulled hard on this undulating track with a fast pace being set but it was those held up at the rear who came through to feature in the finish, with local lady jockey HAYLEY MOORE staying on well on David Simcock’s THEOCRITUS to win by 3/4 of a length from Emily Jones on Gay Kelleway’s EASTERN GIFT with Amy Hutchinson and Julia Feilden’s STRIKE FORCE a further 3 3/4 lengths away in third.